When Can My Children Challenge My Will? One of the main reasons for drafting a Florida will is to minimize the opportunity for fights among your children (or other family members) after you die. Unfortunately, even with a will things do not always go smoothly. If one of your children suspects your will was the product of undue influence or fraud, for example, they may attempt to contest the will. But can they contest a will even if they do not personally stand to gain from a successful challenge? A Florida appeals court recently examined this question. This case actually involves a disagreement over the personal representative of a father’s estate rather than the distribution of property. The father had three adult children. Under the terms of his Florida will, each child would share in his estate equally. The will also named the ex-girlfriend of one of the sons as personal representative. Following the father’s death in 2014, the will was entered into probate and the ex-girlfriend was appointed personal representative. One of the sons–not the personal representative’s ex-boyfriend–subsequently asked the court to revoke probate. He contended the will was the product of unfair influence on the part of his brother and the personal representative. Before the probate court, the son presented evidence that his father lacked capacity when he signed the will a few months before his death. The personal representative did not directly respond to these allegations, and instead moved to dismiss the son’s petition, arguing he lacked standing under Florida law to even contest the will. The problem here, as the probate judge saw it, was that the son did not stand to gain anything by successfully challenging the will. Even if the court declared the will a product of undue influence, at that point Florida’s intestacy law would kick in. Under the rules of intestacy all three sons would share in the estate equally–the same outcome as provided by the will. 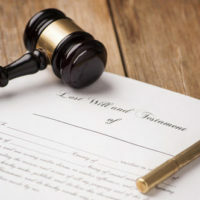 Furthermore, in an intestate estate where there is no surviving spouse, the “person selected a majority in interest of the heirs” serves as personal representative. Here, both of the challenger’s brothers said they would support retaining the existing personal representative if the will was invalidated. But despite all this, the Florida Fourth District Court of Appeal said the probate court was wrong to dismiss the son’s will contest. The appeals court said there was “no requirement” in Florida law that requires someone to “prove his share of the estate would have been different if his revocation attempt succeeded.” And in fact, the son is affected by the outcome of this case since he is seeking removal of the personal representative. Despite his brothers’ continued support for her appointment, the Fourth District noted she has yet to answer the actual undue influence charges levied against her. Consequently, the Fourth District returned this case to the probate court for further proceedings. Do You Have Reason to Contest a Will? Will contests are not common but they do happen. If you have reason to suspect a family member’s will was the product of elder abuse, undue influence or fraud, you should speak with an experienced Fort Myers estate litigation lawyer who can advise you of your options. Contact the Kuhn Law Firm, P.A., today at 239-333-4529 to schedule a free consultation. Delbrouck v. Eberling, Florida Fourth District Court of Appeals, Aug. 30, 2017.